It was hot today, and quite humid in town. A neighbor and I were discussing which was worse - today, or winter. He took the position that he'd rather deal with the heat and not have to shovel snow. I don't necessarily love either extreme, but I think I prefer to deal with the cold, as it always seems like I'm plenty warm after shoveling for an hour. 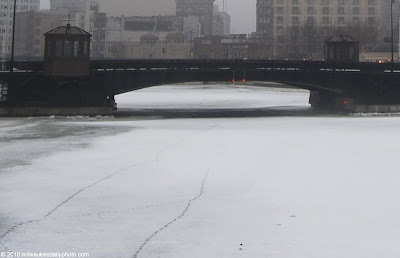 Today's photo is the Milwaukee River this past January, and just looking at it makes me feel better.